Visit the Newburyport Art Association some time between August 20 to September 1, 2013 to see the Newburyport Ten painters show. 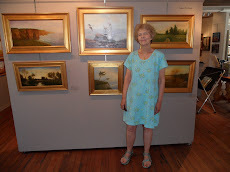 This year's show is an exciting display of Pleine Air and studio paintings. My display includes fourteen paintings most of which were designed and started out doors and then finished in the studio. Reception Friday August 23, 2013 6:00 to 8:00 PM. Rising Moon continues my series of paintings capturing the wonderful marsh scenes along the Rye, NH to Essex, MA coastal marsh. You can compare this painting to the grisaille shown in the post below. Notice some of the changes that were made during the painting process. Early Moring was influenced by the Ming Dynasty landscapes where sloping hills cross each other and meet where water runs between. This is a design I would like to explore more hoping to get more of the delicacy of Chinese painting and use of the unique tree shapes. The tree shapes are loosely taken from local scenes while the other shapes are conceived in the design process.